The trainers choice in Adjustable Flat to Incline and Decline gym benches. Rated for use by performance coaches and athletes. Increase your training efficiency. More exercise variations. Save space in your gym. Transform the MFID into: Flat Bench, Incline Bench, Military / Shoulder Press (Utility) Bench, Decline Bench and Abdominal Bench all in one. Available in straight up smooth black with white markings or slick silver / black combo. You train hard. You look good. Your gym equipment should look good too. Lasercut components for maximum structural integrity and easy assembly. Durable powder coat followed by additional clear coating for long lasting protection. Build guns of steel by adding the ARMA Preacher Curl attachment and explosive legs with the LEGA Leg Curl / Leg Extension attachment. Both sold separately. A versatile bench. Use by itself to perform functional bodyweight movements such as abdominal training. Perform functional and isolated dumbbell exercises. Combine with barbell and rack or squat stands to perform heavy bench presses. Also a great addition to functional trainers. 1600 x 680mm. Save space in your gym. Now you can have a flat bench, incline bench and decline bench all combined into one extremely strong and stable unit. 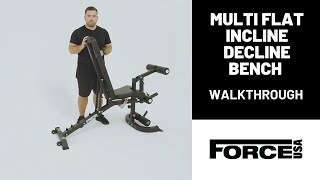 The Force USA MFID is your Multi Flat / Incline / Decline Adjustable bench combo solution. Train efficiently and effectively. Train with American confidence. 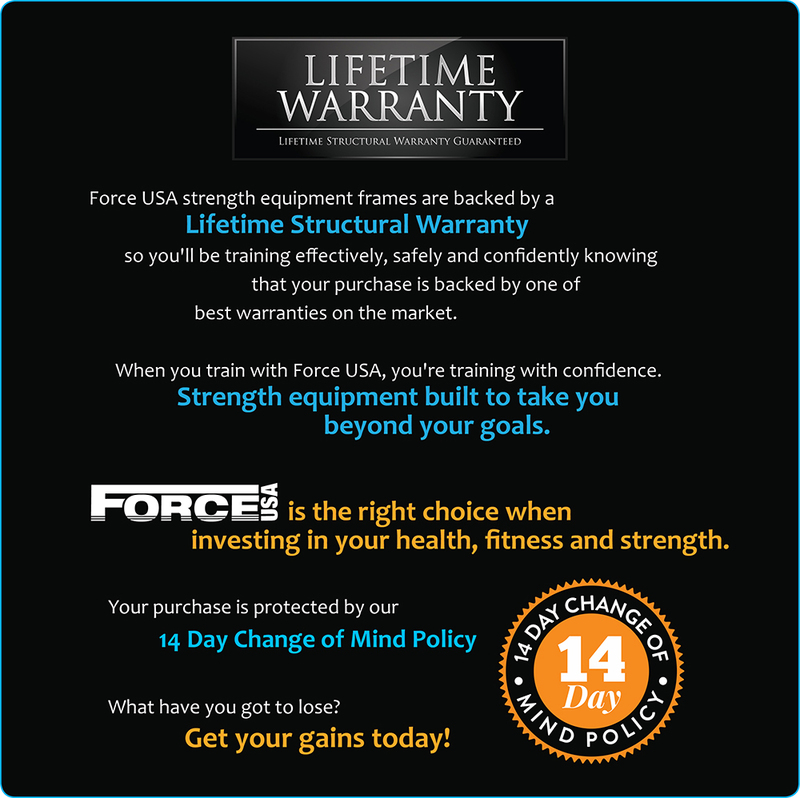 Train with Force USA, the trusted name in strength equipment. I gave it only a three star rating because the back leg doesn't sit flat on the floor. Looks great, works just as well. Very happy with this purchase. Sturdy, portable, and should handle the sweat and abuse planned for it. Good quality product and super fast delivery.